Huawei Nova 3i, is expected to launch soon as another variant of the Nova 3. Earlier this week, the Chinese manufacturer launched the Nova 3 in China as the latest model in the Nova-series. But now, the company is said to be also planning to release a Nova 3i model with slightly different specifications. Interestingly, a new leak suggests that the processor in the Nova 3i will be an all-new Kirin 710 SoC, instead of the Kirin 970 SoC present in the Nova 3. Also, another report has separately claimed that the Nova 3i will launch in the Philippines later this month. 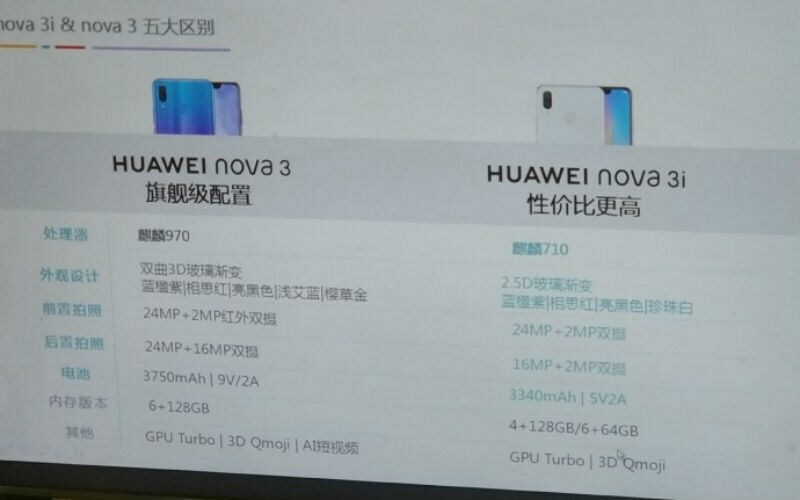 Images leaked by a tipster on Chinese microblogging site Weibo, showcase a comparison of the specifications of the Nova 3 and Nova 3i. Both the smartphones appear to have a similar design – display notch, dual camera setup on both sides, and the fingerprint scanner positioned at the back. As mentioned, the difference lies in the processor, as the Nova 3i will be powered by the Kirin 710 SoC, possibly a mid-tier processor in the HiSilicon portfolio. According to the leak, the Huawei Nova 3i will stick to the same selfie camera setup with a 24-megapixel primary sensor and a 2-megapixel secondary sensor. However, the rear camera setup will include 16-megapixel and 2-megapixel sensors. For comparison, the Nova 3 comes with a 16-megapixel and 24-megapixel combo. Additionally, the Nova 3i battery is also expected to be a bit smaller – 3340 mAh with regular 5V/2A charging, instead of 3750mAh in Nova 3. The leak also suggests that the Huawei Nova 3i will arrive in two variants – 4GB RAM and 128GB storage and 6GB RAM and 64GB storage, which is an odd configuration. In terms of pricing, the tipster has also claimed that the Nova 3i could be priced between CNY 1,999 (roughly Rs. 20,600) and CNY 2,199 (roughly Rs. 22,600). 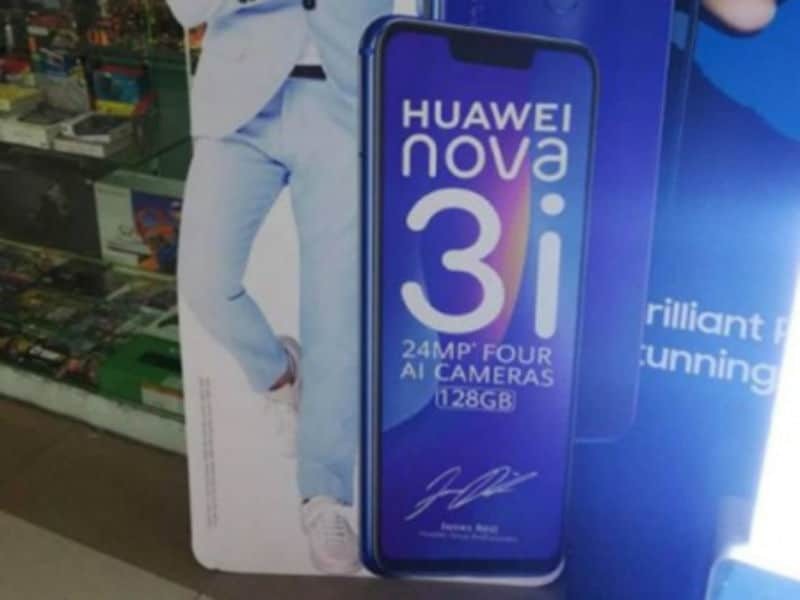 Meanwhile, as per a report in Yugatech, a post in an unofficial Facebook community group for Huawei and Honor PH shows an image that suggests the Huawei Nova 3i will launch in the Philippines on July 28. An advertisement for the new smartphone was spotted in Glorietta Mall in the capital of Manila, as ‘Coming Soon’ with the date of July 28 stamped on the teaser.